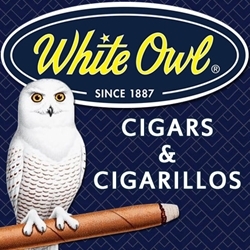 Originated back in 1887, White Owl cigars, cigarillos and blunts have been proving to be one of the most popular and best-selling classic machine made cigar brands in the USA. Today, White Owl’s cigarillos have become a favorite amongst both the new and experienced tobacco enthusiasts. Every machine made cigarillo is packed with high-quality fillers that impart a great taste to the smoke. These fillers have been procured from 5 different countries. White Owl machine made cigars are rolled in a Homogenized Tobacco Leaf (HTL) wrapper that substantially accounts for the slow burn. The overall effect is a mild-strength smoke that is remarkably rich and satin smooth. Whatever the occasion can be, cigar lovers everywhere love White Owl machine made cigars, blunts and cigarillos. These beautifully crafted gems can satisfy a desire for a great smoke letting its user sit back and enjoy a relaxing good time. Smokers Discounts has made it easy and affordable to buy machine made cigars online. Call us for more details!